Click here for audio of Episode 216. Today, we watch books grow old. The University of Houston's College of Engineering presents this series about the machines that make our civilization run, and the people whose ingenuity created them. I was recently studying some hundred-year-old books in the University Library. When I got up to leave, I glanced at my sleeve. It looked like it'd been rubbed on rusty pipes. Every time my arm had brushed the stack of books, some of the old binding had flaked off on my shirt. It turns out that that was just the tip of an iceberg. Books made in the last 200 years are especially cursed with short lifetimes. Their pages become brittle and brown; their bindings crack; they eventually fall apart. Some of you may have had a chance to see a 500-year-old Gutenberg Bible -- one of the first printed books. If you have, you were surely struck by its fine condition -- its pliable, snowy-white pages. The startling fact is that surviving 15th-century books are usually in better shape than 19th-century books. We see why when we look at ancient paper. Papyrus, from which we take the word paper, was made from reed fibers. It was a pretty good material, but medieval scribes preferred to use parchment -- the skin of calves or sheep. Parchment is by far the most durable writing material that ever found common use. An 800-year-old handwritten parchment book often looks as good as new. Linen-based paper was a poor man's substitute for parchment. It's made by reducing linen rags to a fiber slurry. When the slurry's drained over a fine mesh, the fibers reform themselves into a sheet of superb paper. Real linen paper is a lot cheaper than parchment, but it's still very costly by today's standards. Gutenberg printed some Bibles on parchment, but most were less expensive ones, printed on linen paper. Yet even those paper Bibles were wonderful books, and they've stood up remarkably well. The demand for printed books skyrocketed after Gutenberg. And the cost of paper had to be cut. In the seventeenth century, alum was used to speed the reduction of fibers to a pulp. But heat and humidity cause alum to react into hydrochloric acid. 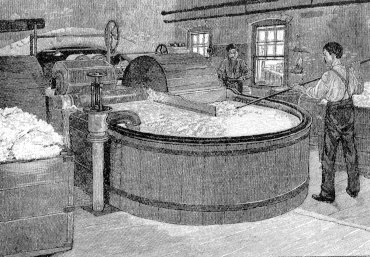 Then later paper-makers used sulfuric acid or chlorine to bleach colored rags. And when people turned to wood fibers in the early 19th century, still other destructive acids were created as byproducts. Graduate students sometimes wonder why they're asked to buy expensive rag paper for their theses. Yet old theses are often among the best preserved books in a library. Most library books are being eaten away from within by all those acids. It's all a big trade-off, of course. Our civilization wouldn't be where it is if we hadn't found ways to make cheap books available. But it's really frightening to have to watch our cultural heritage crumbling away under our fingers. Dean, J.F., The Self Destructing Book. Yearbook of Science and the Future . Chicago: Encyclopaedia Britannica Inc., 1989, pp. 212-225. I am grateful to Pat Bozeman, Head of Special Collections, UH Library, for her counsel throughout this episode. For more on Gutenberg, see Episodes 628, 753, 756, 894, and 992.